"The privacy of a fine hotel, in a grand park-like setting, with the full breakfast of a traditional B&B." Colonial Manor Inn, the oldest operating Inn on Virginia's Eastern Shore, was built as a private home in 1882. It was purchased in the 1930's by Mrs. Leola Horsey who saw the need for lodging suitable for the working men and women coming into the area. She set up the boarding house, the Colonial Manor Inn. Her reputation for fair prices, warm hospitality and great cooking kept her house full. Her daughter, June Evans, carried on the tradition of warm hospitality from the 1970's on, but no longer served meals. 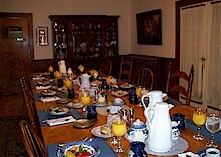 Now we serve a full breakfast daily, family style, at our huge dining table that seats 14. There you will meet fellow guests, share stories of your previous day's adventures or the present day's plans. Through the decades Colonial Manor Inn, located in the historic waterfront community of Onancock Virginia, has kept its doors open to Eastern Shore of Virginia business travelers, visitors, vacationers, and honeymooners providing warmth, friendliness, and genuine hospitality to all those who have stayed at the Inn. The Inn offers 4500 sq ft of guest area, all private baths, unlimited on site parking and manicured grounds spanning 2 acres. 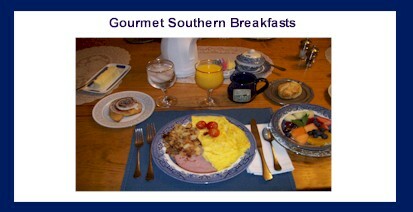 With a hearty breakfast served daily, the Colonial Manor Inn is by far the best lodging value on Virginia's Eastern Shore. The Inn is decorated with an eclectic assortment of antiques and collectibles providing casual elegance with an Eastern Shore of Virginia atmosphere. Situated within walking distance of downtown Onancock, guests have easy access to restaurants, historic buildings, boutique and antique shops, the Town Waterfront and more. 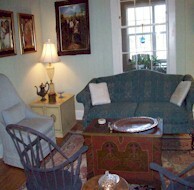 Guest Areas: Relax &enjoy our newly renovated, enclosed front porch that is furnished to accommodate you year round. It's a perfect place to curl up with a good book & cup of coffee or for an evening beverage before heading out to dinner. Speaking of good books, there are many throughout the house or in the library for your use. The guest living room is also a place to make yourself comfortable. In addition, for those who need internet access, we have free WI FI throughout the inn. Enjoy the lovely gazebo in the back yard surrounded by the lawns and country gardens. With almost 2 acres, you have plenty of room to meander about! Breakfast: A full breakfast is served daily at 8:30 a.m. Creating wonderful breakfast delights is our pleasure. An example of the daily breakfast we prepare: consist of coffee, tea, yogurt, cereals, and fresh fruit, quiches, eggs benedict, Virginia ham, homemade buttermilk pancakes, french toast and more. You will not leave the breakfast table hungry. We are happy to accommodate dietary restrictions with advanced notice.